The Three Friends have had a busy week! It seems like Luanne is always moving someone and that is just what she was doing this week. Sherri and I also had a couple of appointments to keep. She had an appointment in Birmingham and I enjoyed getting to go with her. Then the very next day she and I helped an ill friend get to his doctor's appointment in Huntsville. So, while we are waiting for Luanne to finish her moving project and catch back up with us, I thought this might be a good time for another recipe. How about shortbread? How about one basic recipe with three variations? I beat the butter and sugar in my electric mixer until it was light and fluffy and then added the lemon zest and thyme. Then I mixed the salt into the flour and gradually added the mixture to the butter and sugar, just until the flour was incorporated. I placed the soft dough onto plastic wrap and rolled it into a log. I used the plastic wrap to help with this, because the dough is very soft and will stick to your hands. Then I rolled the dough in the plastic and placed the log of dough into the refrigerator to chill for about an hour. When the dough had hardened, I took it out and sliced it into 1/2" slices and placed the slices about two inches apart on parchment covered cookie sheets. I put the cookie sheets into a preheated 375 degree oven for about 15 minutes, or until the cookies were lightly browned on the edges. Oh, my...they were so good! And that was the beginning of my shortbread adventure, because that got me to thinking about the other herbs in my garden and which ones I could use in place of the thyme. So....I got my ingredients back out and this time, in place of the thyme, I added one teaspoon of lavender. Why one teaspoon of lavender when the original recipe called for 2 teaspoons of thyme? Well, I know that lavender can be overpowering, so I decided to err on the side of restraint. I think that was a good move, because the lemon lavender cookies were wonderful. But, I still was not done! I have lots of rosemary in my garden and I also have a recipe for salted rosemary shortbread that I think is divine, so I knew rosemary could work here, too. This time, however, I decided to not only replace the herb, I had the idea to change the citrus, too. So, instead of lemon zest, I chose to use 1 tablespoon of orange zest and I added 2 teaspoons of rosemary, chopped very well. It is very important to finely chop the rosemary because you don't want to get a big, pointy piece of rosemary in your cookie. Because I also knew that a little bit of finishing salt enhances rosemary shortbread, I finished with a sprinkling of pink sea salt right before putting the orange rosemary cookies in the oven. Once again, I achieved shortbread success! 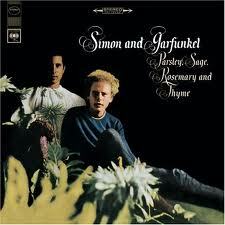 Sorry, Simon and Garfunkel, I don't think parsley and sage would work with shortbread. I am happy that I now have three shortbread cookies using one simple dough. Try them out and let me know what you think. Oh, and I am really going out on a limb here quoting song lyrics and matching songs to artists! Sherri and Luanne are probably going to tell me I got something wrong, so just ignore them if they do. That's what I do!